- Reports up to 115 vehicles may be involved. Major pileup I-94 Battle Creek, Michigan. 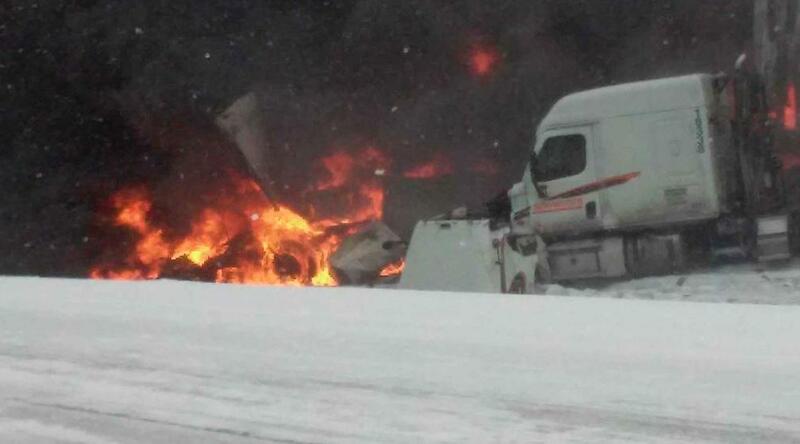 BATTLE CREEK, Mich. (WOOD) — Both directions of I-94 are closed west of Battle Creek and an evacuation order is in place due to two pileups including as many as 115 vehicles and one fatality, according to Michigan State Police Lt. Rick Pazder. The evacuation covers a three-mile radius from I-94 at the 90 mile marker, which is located near 44th Street in Charleston Township. MSP is asking anyone who lives in the area to leave their homes immediately due to a possible hazmat situation. Both directions of I-94 were shut down shortly after 10 a.m. between the Galesburg and Climax exits (exits 88 and 92) after pileups occurred in both the eastbound and westbound lanes. Re: 115 car pileup in Michigan/ 3 mile evacuation ZONE!! - Michigan State Police told 24 Hour News that at least four semi-trucks and two cars are still on fire, including one truck that is carrying hazardous materials and another that is full of fireworks. Re: 150 car pileup in Michigan/ 3 mile evacuation ZONE!! New estimates are 150 vehicles involved. So sorry to read of this horror. The temps are so low and add in the wind chill... My prayers for all involved.